There are a lot of exciting benefits to having a suite style dorm room. One of the most exciting benefits is that you get a private dorm bathroom! And then there are a lot of exciting benefits to having a private dorm bathroom. One of them being that you get to sleep in a little longer since you're not coordinating your shower schedule around the rest of your dorm floor. You also get to decorate that dorm bathroom just like you do the rest of your college dorm room! You may think it's a little more stressful to think of all the dorm essentials you need to add to your college dorm checklist because you have your own dorm bathroom, but DormCo specializes in cheap dorm supplies to help take some of that stress away. One of the dorm necessities you're going to need to add to your college dorm checklist is a dorm shower curtain. Your college may provide you with a dorm shower curtain, but you will definitely want to replace it if they do. If they provide you with a dorm shower curtain, it's going to be very plain, just like your dorm room walls. It may even be the same color as your dorm room walls. When you wake up in the morning, the last thing you want to do is look at a dull dorm shower curtain. It won't help to wake you up very much. 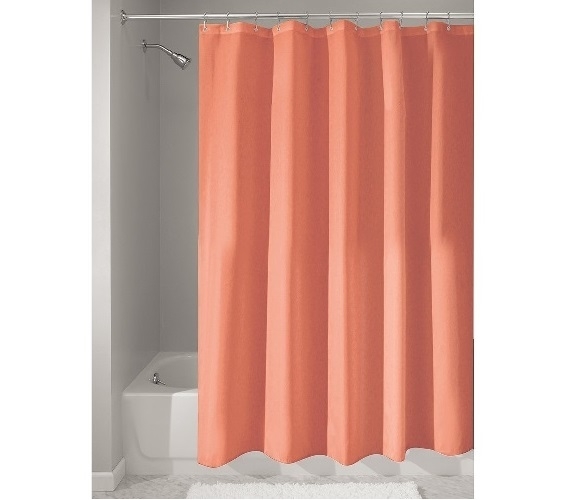 Our Fabric Shower Curtain in Coral has a bright solid coral color that will add a bright pop of color to the dorm room decor of your dorm bathroom. With this dorm shower curtain in your college supplies, you can mix and match the rest of your bathroom dorm room decorations with the bright solid color of this dorm necessity!